A Silver fountain pen with a beautiful engine turned finish. 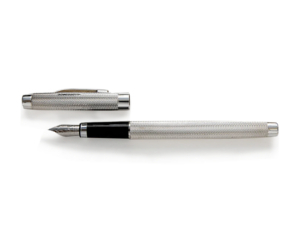 This pen is the epitome of luxury classic design. A fine silver nib for writing and completely handmade it is a luxury pen that will make signing your name a pleasure. Polished to a high shine and hallmarked in the Birmingham Assay office, it would make a great gift for a couple on their wedding day to sign the marriage certificate with their new names. A gift that is sure to be treasured always. You could even add a silver lidded ink bottle to your order to make it extra special.